A chambray shirt you can wear for work or play, The Bostwick Chambray is the end all be all of dress shirts. This shirt features a blue, red and purple check pattern with a heathered effect that gives the illusion of linen fabric. This lightweight and breathable shirt is constructed with 100% luxury cotton chambray fabric from Albini. 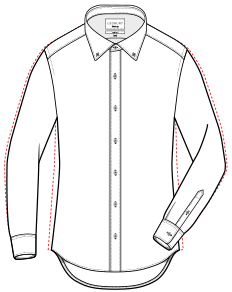 Finished with the Ledbury Spread collar and single-barrel cuffs with reinforced buttons. Slim fit features a darted back for a more tailored fit around the torso. Fit: Available in classic and slim fit. Slim fit features a darted back for a tailored fit throughout the torso.